I’ve been playing my share of games with a focus on cars since Rad Racer 2 on the NES, and I’ve been off and on with them over the years. However, it doesn’t take much time to choose which my favorite is: Burnout Paradise. Between the races, the exploration, and the cars, it’s hard not to fall in love. One aspect reigns king over everything else though, and that’s the wrecks and explosions. 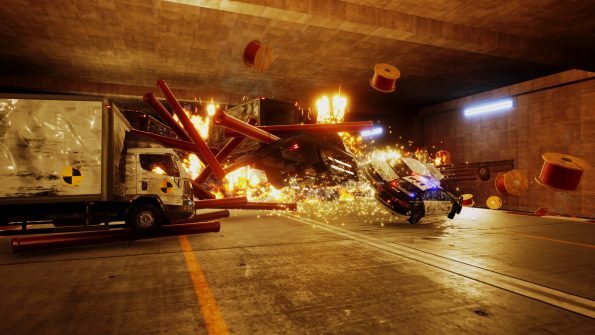 So naturally, a game with a focus on creating the biggest wreck possible from the creators of Burnout can only be great. Danger Zone is the latest game from Three Fields Entertainment, a developer with alumni from Criterion, and it’s exactly what you’d want from the team. There’s a gas pedal, brakes, an explosion button, and steering; nothing more, nothing less. The game is score based, and levels are unlocked after reaching a certain threshold. The game doesn’t require much more explanation, and for that it’s great. Each level contains collectibles to boost your score, as well as to give extra explosions to move the car about for collection and destruction. After collecting all of the money boosts in a level, a special golden one will appear to enhance your score even more. Each level is more or less a living puzzle, and like a puzzle, it never changes. Of course, recreating the exact same outcome is difficult, and not something you want to do anyway. The goal is to attain the highest possible score, and recreating the same one would be pointless. As you progress, more obstacles become part of the puzzles, meaning you have to think about your approach differently. While the beginning puzzles are obvious in approach, the latter ones give options. Deciding what will yield the most points from crashes is essential, as timing becomes huge in your destruction of each level. Be prepared to play these levels a lot though. While there aren’t many (20), solving each puzzle will require a lot of replaying. If you plan on completing the game, you’ll have to learn the intricacies of each level. Regrettably, the game does lack a bit of wonder with that being the whole package. The game has no extra modes, no different environments, no unlockable cars, and no crash cams with extreme detail. 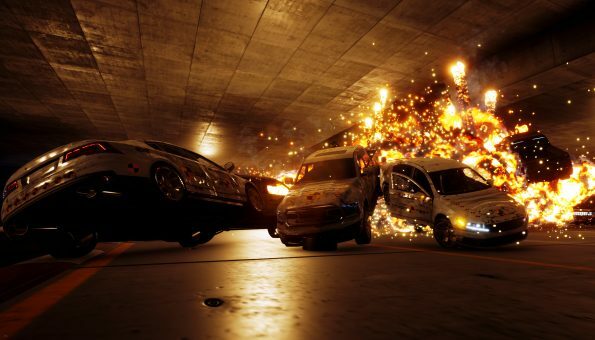 While the game is a good time, it lacks the polish and the pizazz that the Burnout series has always brought to the table. But it’s still great to get back into the world of exploding cars, even if it does take place in a contained, sanitized warehouse. 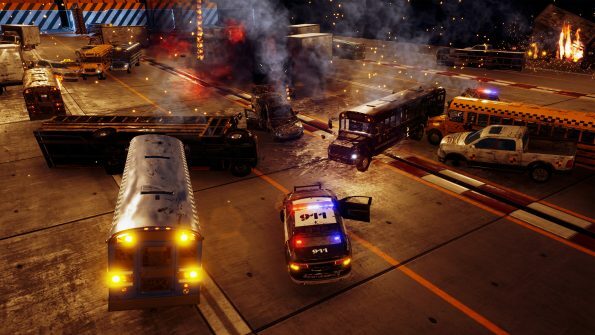 Danger Zone is a throwback to what many people loved about the Burnout series, and while it’s not the spiritual successor you may have hoped for, it’s a fun, albeit short game. If you’re looking for something you can pick up and play without much investment, you may find this is a great little game. If you’re wanting a full blown Burnout successor, you won’t find that here, but the price doesn’t reflect it either. Danger Zone was developed and published by Three Fields Entertainment. The game launched on PC and PS4 for $12.99 on May 29th, 2017. The game was provided to us for review on PS4. If you’d like to see more of Danger Zone, check out the official site.